The stock market continues to feed on improving economic data, tax reform and a gradualist Fed policy that doesn’t receive a lot of press at present. The Federal Open Market Committee (FOMC) raised the Fed funds rate by a quarter of a point to 1.5% on December 13, 2017. It had been raised to 1.25% on June 14, 2017. That’s just two months after was hiked to 1.0% in March. The Fed forecast three rate hikes in early 2017 and was able to stick to that dot plot plan schedule. 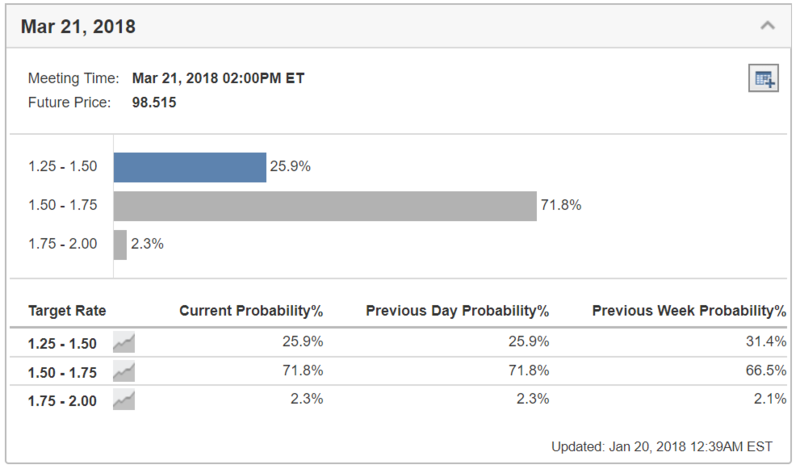 The yield on the 10-year Treasury Note closed at 2.63% last Friday, the highest level in nearly four years and just in front of the Jan. 31 FOMC meeting, where there is a better than 96% probability the Fed will stand pat on rates after just hiking in December. I would think that if the 10-year T-Note yield spikes up towards 3.0% by the time the Fed meets at the end of the month, we will see a more hawkish policy statement emerge that sets the table for a hike in March. It’s interesting that within just the past three weeks, much of the concern has been focused on the threat of an inverted yield curve. And deservedly so, as that situation has barely improved. 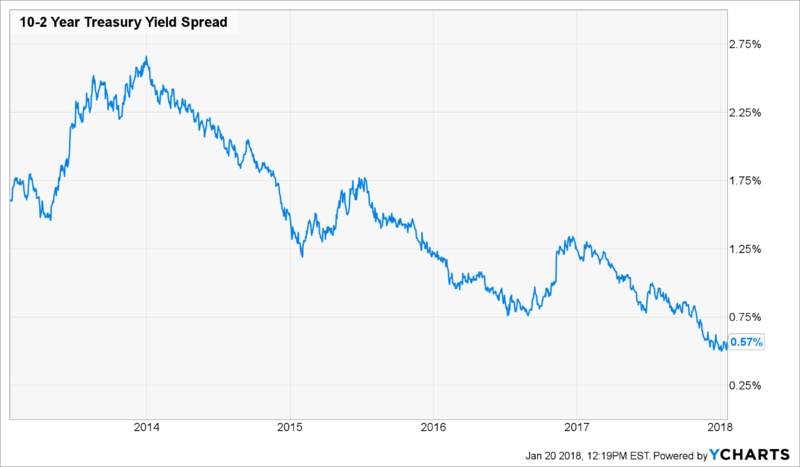 The 10-2 year spread is currently sitting at 0.57%, a level not seen since February 2008. However, if this past week’s move up for the 10-year bond is any indication, fears of an inverted yield curve could be dampened materially. In fact, the Fed may deliberately use the current pop in yields as a basis to voice more hawkish rhetoric simply to goose the spread further off the multi-year low and apply a little braking action to what they might see as an overheated stock market. The rotation to a new FOMC comes at an interesting time. The U.S. economy, along with the global economy for that matter, is picking up steam. Meanwhile, major stock indices are at record highs and asset valuations have been stretched on the persistence of low interest rates. The question entering 2018 isn’t whether the FOMC will raise the Fed funds rate, but rather how many times. The Federal Reserve’s latest interest rate projections point to the potential for at least three rate hikes in 2018. The Fed funds futures market, however, is only pricing in the probability of two rate hikes in 2018. That’s an important divergence, but unlike past years, there is a healthy respect for the possibility that the Federal Reserve, and not the market, will be right with its rate-hike projections. The latter consideration stems in part from the fact that the Federal Reserve raised the Fed funds rate three times in 2017, as it stated it might, and yet the economy and stock market strengthened right along with those rate hikes. Additionally, the passage of the tax bill is regarded by many as an expedient for stronger growth in 2018. The incoming FOMC officials appear to be aligned with the gradual approach to raising the target range for the Fed funds rate, but importantly, no one at this juncture is trying to sell the thought that the United States doesn’t need another rate hike. There is no clear-cut dove on the 2018 FOMC like there was on the 2017 FOMC in Minneapolis Fed President Kashkari, who voted against all three rate hikes. Rather, there seems to be a broad collection of centrists on the FOMC, which is fitting given the disparate economic dynamic of accelerating growth and low inflation that exists as we enter 2018. A centrist, by definition, doesn’t have strong conviction in their views. The 2018 FOMC, then, could do more, or less, than expected on the rate-hike front, and the stock market has greatly appreciated an FOMC that has been slow and deliberate with its rate hikes. With this in mind, there is an inherent risk to the stock market if the 2018 FOMC ends up being more aggressive with its interest rate policy than is currently expected by the Federal Reserve itself. Will a Surge in Spring Be Followed by a Summer Swoon? Heading into the fourth quarter, U.S. business investment was exceeding $500 billion, and that number is only going to expand with the passage of tax reform that lowered the average corporation’s tax rate estimates 5-7% on a net basis. It’s my view that solidly bullish forward guidance will accompany earnings as the brunt of earnings reports cross the tape, sowing the seeds for a March rate hike. 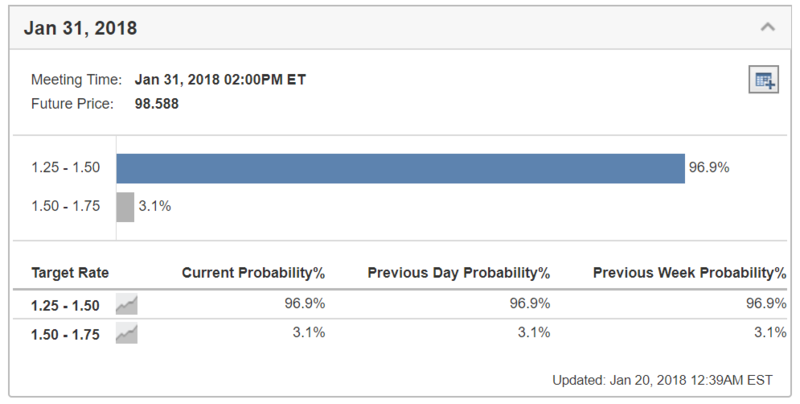 And while there is little expectation of a rate hike in May, there is already a 54% forecast for another hike in June. I think the market is fully accepting of a 2.0% Fed funds rate, as it would coincide with a 3.0% or greater rate of growth for domestic gross domestic product (GDP). 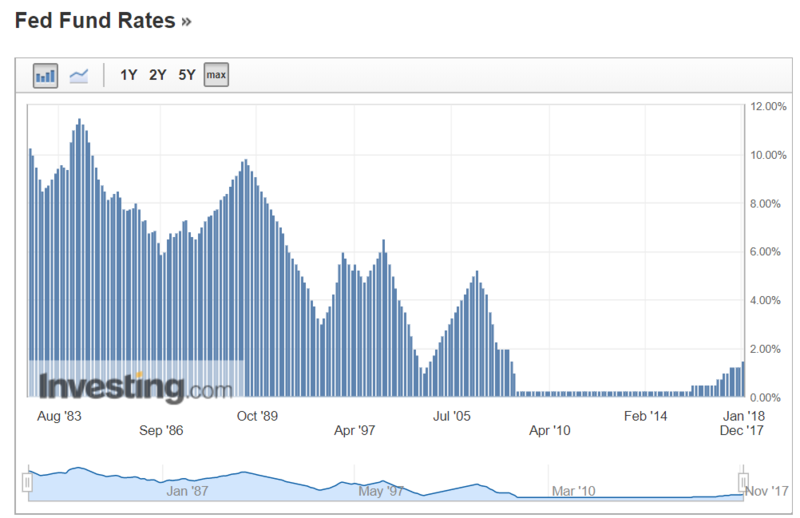 Seeing where the Fed funds rate was in years past and where it is today offers a stark picture. The stock market is enjoying the best of times against Goldilocks-like credit market conditions. If the Fed is correct in their 2018 dot plot plan to raise the Fed Funds Rate to 2.0% by the year’s end, then the final hike will probably be late in the year, past the mid-term elections that are quickly becoming a potential market headwind. To this point, the case for a classic “sell in May and go away” scenario could well be shaping up, at least for “the correction” that may refresh the bull market’s longevity. Think about it: first-quarter earnings reporting season, from mid-April through early May, will be in the bag, the percent chance of a Fed rate hike will likely be in the high 90s, heightened chatter about the European Central Bank (ECB) curtailing quantitative easing (QE) will be in focus, the season of listless summer trading will be just around the corner and the toxicity of the mid-term election campaign trail will be like a firehose of venom. Sounds like a good time to protect gains, head to the beach for Mai Tais and Yahtzee and let the summer months play out. Maximizing all the market has to offer during what should be a very strong next four months should be on every investor’s mind. My Hi-Tech Trader advisory service zeroes in on the best growth tech stocks that are highly favored by professional fund managers. We not only buy the stocks, but also buy and trade short-term calls in the same stocks as well. In doing so, we leverage our total returns and strike while the iron’s hot. We just booked a 253% gain in PayPal calls and 176% gain in STMicroelectronics on a 14% move up for both stocks inside three weeks. To learn more about Hi-Tech Trader, go to this page and get in on our next hot tech trade. We keep our trading portfolio to just five live trades, which gives us laser focus on the crème-de-la-crème tech stocks that are moving best. If you want a red-hot tech component to your portfolio, you came to the right place. Hi-Tech Trader is for serious traders that are serious about tech. In case you missed it, I encourage you to read my e-letter article from last week about why the bull market has been bulletproof. 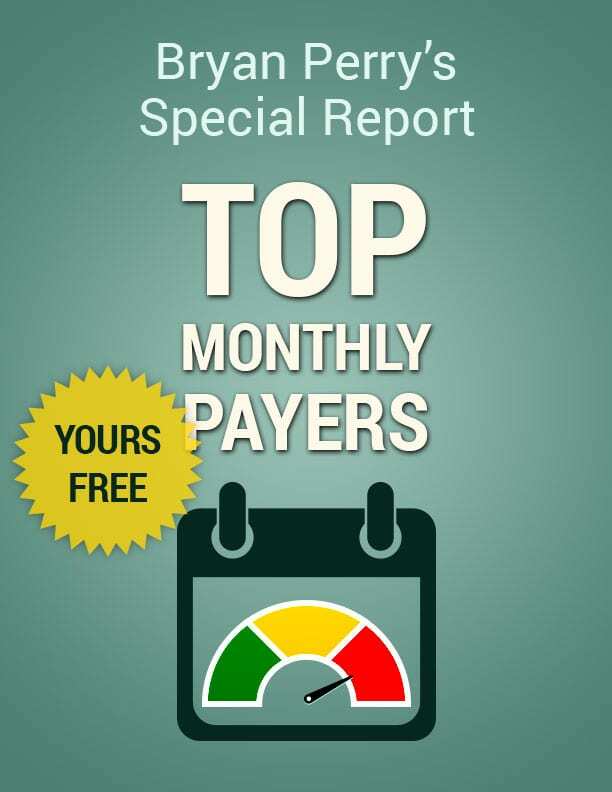 Get paid every single month by some of the world’s biggest companies. Income investment expert Bryan Perry explains the resilience of this bull market.